Eight teams. Four judges. 30 minutes. One pan. 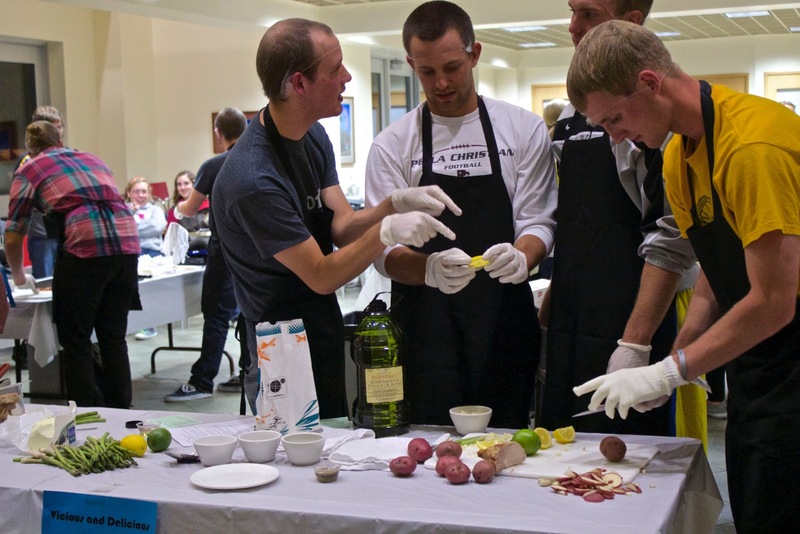 At 7 p.m. on Friday, October 11, the Food Network jumped out of our televisions sets and came to life in the Grille area of Dordt’s Campus Center. You Are What You Eat is a competition that challenges groups to create one healthy and affordable entree in 30 minutes. The only catch is that all teams only have one pan to create it in. From Vicious and Delicious to Professor Cous Cous, all teams were cleverly named. Put on by S.W.A.T, the student wellness advisory team, the event was held to promote health and wellness on campus. Food such as chicken and apple lettuce wraps, pork loin with quinoa concoction and couscous with vegetables made the audience’s mouth water. All teams were prepared at the countdown. An enthusiastic “go” filled the space and the campus center went from quiet to loud in a second. The room was filled with chopping, dicing and hairnets. Each team was provided with one burner to cook their dish. 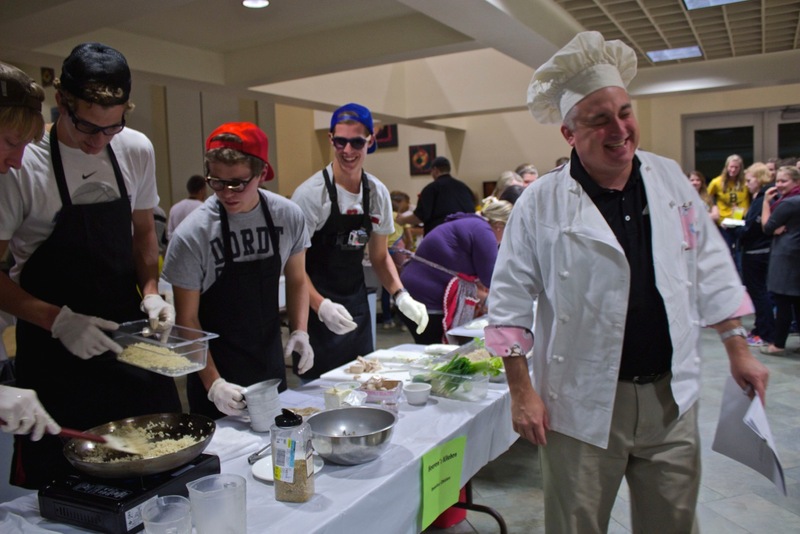 When the competition was underway, Commons cook Nick Lawrence made his way around to each table to make sure all health codes were being met. Paul Fessler, professor of history, was not far behind. He scoped out the competition decked out in full restaurant apparel, chef’s hat included. There to relieve pressure were M.C.’s Derek Vander Ark, a man with a voice for radio, and Jake Byma, the next Last Comic Standing. The dynamic duo came prepared with plenty of vegetable jokes. During the 30 minutes, nutritionist Jennifer Hinkle gave a short presentation on the different ways to stay happy and healthy in college. Her words, however, did not take off the edge that all individuals were feeling. Everyone was feeling the pressure, especially Chris Geels and Tanner Brasser. Their recipe “Fat” Mac & Cheese with Bacon did not fit the ‘healthy’ category, so there was worry of potentially losing the 1st place spot. “I am feeling an intense pressure. I haven’t felt this sort of pressure in a long time,” said Geels. At the sound of ‘stop’, all utensils were put down. Some teams had already gotten their dishes on the judging table. At this time, Fessler, Lawrence, and Hinkle made their way to the stage. Senior Joel Kranenberg, S.W.A.T member and judge, followed not far behind. Good comments were constant, but there was still heartbreak. “I have a quick question. Did a hockey puck die in your dish?” Fessler asked team Hell’s Kitchen, which consisted of four men wearing hockey jerseys. Once all dishes were tested, the judges quickly and quietly chose their winner. The team What’s Cookin’ Good Lookin’, consisting of Meghan Stadheim, Emily Broers, Hanna Wagenaar, and Kristin Madden, took the first place prize. Their winnings included cooking gear such as mini whisks and Tupperware. All other teams won carrots, oatmeal or apples. You Are What You Eat was a success. All eight teams may have received a prize, but they didn’t leave the audience in the dark. Taste testing capped off the evening and no Tupperware was needed to store leftovers. In the end no one walked away with an empty stomach.